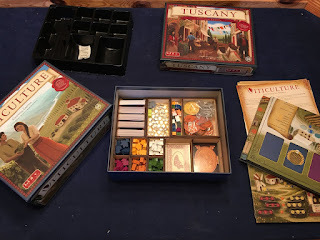 Yesterday we finished up a session of one of my favorite games, Viticulture, with the “Tuscany” expansion I received for XMas. I found myself wishing that everything would fit in one box. Glowforge to the rescue! 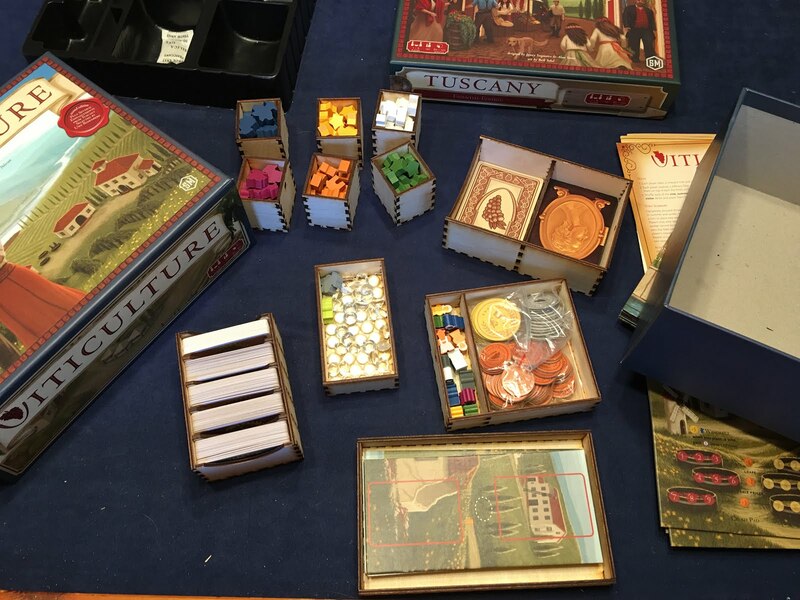 Designing inserts to better fit game components seems to be very relaxing for me for some reason. Lots of math and measuring clears the mind. Everything now fits neatly in one box, which has allowed me to ditch the annoying plastic insert the game came with, as well as the second box. Everything was made from 3mm Baltic Birch ply bought from Woodpeckers/Amazon. I want to change the box with the large cards to have holes on the sides so that you can grab the cards easily, and maybe a tray to separate the coin values. Those are my main regrets.